So. Yikes, it’s 2018. Hello new year. Let’s get cracking with a new type of post – a review. Ooh. Digital photographs are brilliant. You can take as many as you want and look back at them instantly, you can share them and print them on mugs and t-shirts and all sorts. I remember using film and I don’t think that digital photography replaces it necessarily… but that’s a discussion for another time. I came across Saal Digital in a small Instagram ad, and was intrigued enough to sign up. I thought, why not? Their deal? 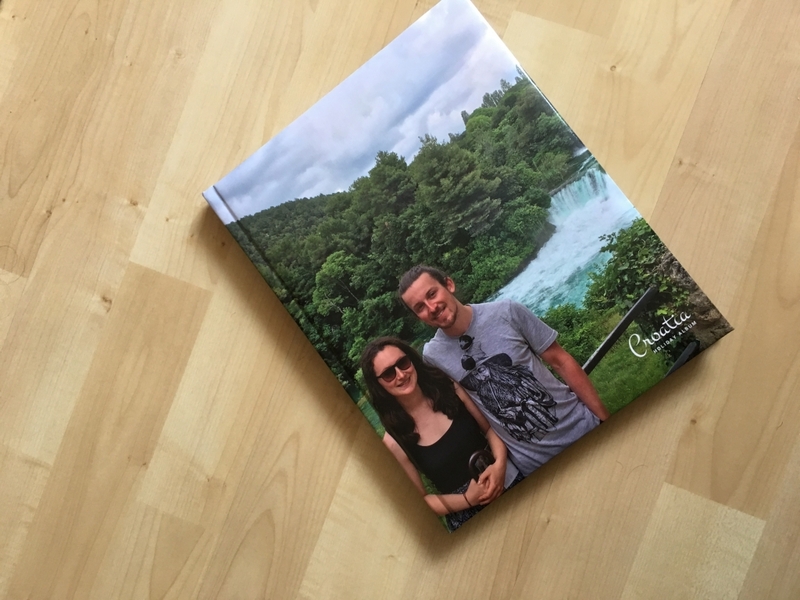 I order one of their photobooks with a £40 discount, and in exchange I write a product review when it arrives. Yeah, that’s really the deal. I admire their honesty and transparency. 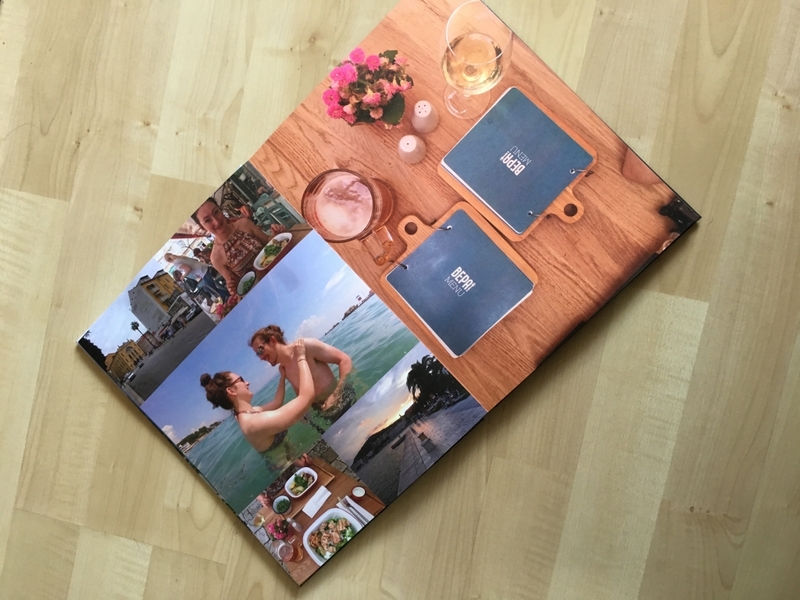 Yes, I got £40 off a photobook and yes, that may have biased me slightly, however: they have not pressed me to present their product in a positive light and they also haven’t pushed me to share my experience with everyone I know – they simply asked me to write a review and post it somewhere online. The quality of the book is really, really good. It doesn’t strike you as cheap (well, in fairness, it isn’t) and it carries a bit of weight. The pages are beautifully clear and crisp, and not too flimsy. The flexibility of their software let me lay out my photos how I wanted, and gave me a pretty accurate representation of how the book would look before I sent it off to be printed (a process which was very smooth and handled entirely in their own propriety software). The image quality is brilliant. The print is really sharp and shows a great amount of fine detail, and the colour representation is also on point. Sometimes I’ve found that photos can look much darker when printed (and thus lose quite a bit of their dynamic range) but the colours in the book look well balanced and, if I’m honest, not very different to how they look on screen. Bravo Saal Digital, bravo. Also, their customer service was good. I’ve been a bit late posting my review, having received my book at the end of October, but they’ve been nothing but polite. Replying to their emails does at first seem to put you in some sort of help-ticket system (complete with automated responses) but hey I’m willing to let that slide. Ah, the negatives. OK, first off none of these are deal-breakers for me, as I got this book with a £40 discount. However in the spirit of fairness I feel it’s fair to give Saal (and you, reading this) some honest feedback. My biggest gripe really was the software. I understand that image editing software is tricky and that coding it is no mean feat, however my experience with the catchily-titled “SaalDesignSoftwareUK” app wasn’t all that great. My main problem came with loading images – it would bug out quite a bit and refuse to load thumbnails of photos, leaving me taking stabs in the dark as to whether I was importing the image I wanted or not. 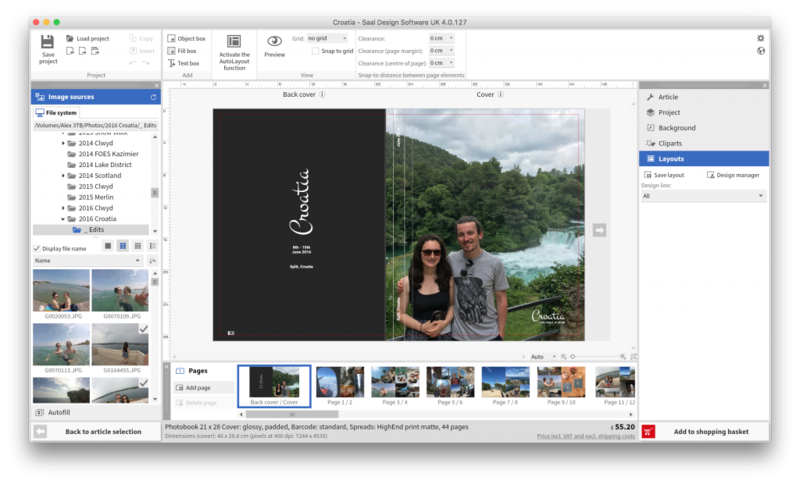 It’s not badly designed software, but for me it’s not as easy to use as I’d like. Yes, I could have gone through all my photos and named the ones I’d wanted to import – but that’s a lot of effort sorting through 600+ images, and not something I can imagine a lot of people would be comfortable doing. The autofill feature is nice, and the software has a handy image quality notification which stops you getting pixellated images – I appreciate that and it definitely helps in producing a more refined and polished final book. I also had a couple of issues with just navigating through the software in general: panning and zooming on the book previews was a bit of a faff, and also quite sluggish which made things a little frustrating. Its auto-snap feature also didn’t work all the time, which caused me to have a white line of background appear between two images in my book – something that I couldn’t see in the software. A small issue and it definitely won’t affect everyone, but it did catch me out a little bit. Finally, this isn’t a criticism of Saal Digital necessarily, but moreso the photobook industry in general – the price. Now, I got a £40 discount as I’ve said, but had I not had that, this book would have cost me £55.20 plus delivery. To me, that’s more than a bit steep and I definitely can’t justify spending that to make a holiday album each time we go away. So the price puts this product out of my reach and also a lot of my friends and family who don’t have that kind of money to spend. The book itself is wonderful and I’m supremely grateful for Saal Digital in getting in touch with me and letting me try it out, and then letting me write whatever I wanted as a form of payment. I admire the company and their openness, and think that they have the potential to be a big player in the future of photobooks if they can just sort out some of the gripes with their software (and maybe make the products a little more affordable, although I appreciate this is tricky!). It’s something that we’ll treasure and keep as a memory of a very special holiday, and we’ve been able to share it and our experiences with many of our friends and family. It goes one step above an old photo album, and I’d love to get more and create a collection of memories that we could look back on in years to come. Just hopefully I won’t have to take out a loan to make that dream a reality.